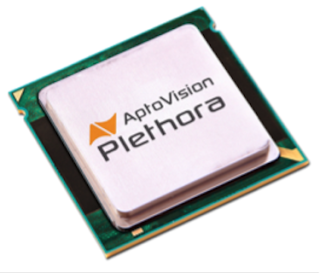 AptoVision has introduced Plethora, an in-line engine for high fidelity processing of uncompressed audio and video signals. Plethora provides broadcast-quality scaling, color space conversion, frame rate conversion, and several audio functions. It also features AptoVision’s exclusive light compression technology for visually indistinguishable image transmission. The Montreal-based company will feature its Plethora engine at ISE (Stand 10-P151). Available on its BlueRiver NT+ and new BlueRiver 400 chipsets, the Plethora engine is named for the numerous functions it integrates into a single signal processing subsystem. These functions include scaling, visually “indistinguishable” light compression, color space conversion, frame rate conversion, audio embedding/de-embedding, audio down-mixing, and audio re-sampling. “The Plethora engine is fully embedded into and tightly coupled with the BlueRiver chipsets’ signal extension and switching capabilities, delivering the world’s first and only single-chip solutions for end-to-end signal distribution and processing,” said Tremblay.